Title: Are Mutual Fund Managers Good Gamblers? I investigate the skill of mutual fund managers by focusing in their holdings of a special type of stock. Kumar (2009) classifies low price, high idiosyncratic risk and skewness stocks as ‘Lottery Stocks’, and shows that these securities severely under-perform. I look at the effect that these investments have on the performance of U.S. equity mutual funds, and how they reflect on the skill of the manager. As part of this analysis I introduce the ‘Lottery Score’, the percentage of equity assets invested in Lottery Stocks. I find that the Lottery Stocks that fund managers pick tend to outperform the rest of the market, and the funds themselves persistently outperform similar funds that don’t invest in these stocks. An investable strategy that buys Lottery Stocks held by the funds and sells those ignored by them attains a monthly alpha of 2%. The Lottery Score is shown to be a good predictor of fund performance, even after controlling for a number of previously introduced measures of skill. Since the funds’ out-performance cannot be fully explained by their allocation to Lottery Stocks, this behavior uncovers a more general ability for asset management. "Following the literature that analyses which securities fund managers hold and which they avoid, I focus in a particular type of stock labeled by Kumar (2009) ‘Lottery Stocks’. Compared to the median of all stocks that trade in the U.S. equity market, Lottery Stocks have a lower price, higher idiosyncratic volatility and idiosyncratic skewness. Kumar describes Lottery Stocks as ‘long shots’ which are similar to lottery tickets, in that they offer a risky investment opportunity at a relatively low cost and, should the gamble pay off, a high reward as well. He shows that retail investors who prefer these stocks also have a higher demand for lotteries. Unfortunately for these investors, Kumar shows that the average Lottery Stock underperforms other stocks by about 66 bps per month. While Kumar focuses on retail investors, I look at the ‘gambling’ behavior of mutual fund managers in terms of their investments in Lottery Stocks. First, do professional investors, such as mutual fund managers, invest in Lottery Stocks? Second, what impact do these investments have on the performance of the fund? I study these questions by looking at the portfolio holdings of a large sample of actively managed mutual funds that invest mostly in U.S. equities, and I introduce the ‘Lottery Score’ which is the percentage of a fund’s equity capital invested in these Lottery Stocks. I find that a relatively large number of mutual funds report at least some investments in Lottery Stocks, from a low of 50% of all funds in the mid-1990’s to more than 85% in recent years. For most funds the capital devoted to these securities is minute, with the average Lottery Score of the sample below 4% at its highest. However, managers of riskier funds (micro and small cap funds, growth funds) invest larger portions of their capital in these stocks, sometimes topping 10% of assets. Unlike Kumar’s (2009) results for the full sample of Lottery Stocks, I find that the average Lottery Stocks held by a mutual fund consistently outperform all other stocks in the market by 62 bps per month, in terms of a four-factor alpha. Mutual funds that invest in Lottery Stocks outperform those that do not by 10 bps per month. The preference of fund managers for investing in Lottery Stocks, their ‘gambling’ behavior, is persistent in time, as is their outperformance with respect to their peers. There is a stark difference between the performance of Lottery Stocks held by fund managers, and the more modest outperformance of their funds. This is due to the small portion of assets allocated on average to these long-shot bets. Risk-taking and short-selling constraints might be the cause of the small effect of Lottery Stocks in mutual fund performance." Title: Manipulation in the VIX ? At the settlement time of the VIX Volatility Index, volume spikes on S&P 500 Index (SPX) options, but only in the out-of-the-money options that are used to calculate the VIX, and more so for options with a higher and discontinuous influence on VIX. We investigate alternative explanations of coordinated liquidity trading and hedging. Tests including those utilizing differences in put and call options, open interest around the settlement, and a similar volatility contract with an entirely different settlement procedure are inconsistent with these explanations, but consistent with market manipulation. Size and liquidity differences between the SPX and VIX markets may facilitate the sizeable settlement deviations. fficult to arbitrage away price deviations, and large and liquid upper-level market tied to it that translates such deviations into a sizable potential payout. uence the VIX settlement calculation and the value of expiring upper-level VIX derivatives. But, manipulators could leave footprints in the data. ficant trading volume spikes occur in the underlying SPX options. Second, the spike occurs only in the OTM SPX options that are included in the VIX settlement calculation and not in the excluded in-the-money (ITM) SPX options. Third, there is no spike in volume for similar S&P 100 Index (OEX) or SPDR S&P 500 ETF (SPY) options that are unconnected to volatility index derivatives. Fourth, the VIX calculation is more sensitive to price changes of deeper OTM SPX put options. If traders sought to manipulate the VIX settlement, they would want to move the prices by optimally spreading their trades across the SPX strikes and increasing the number of trades in the far OTM put options. Trading volume at settlement follows this pattern, whereas normally far OTM options are rarely traded. Fifth, there are certain options that exhibit discontinuously higher weighting in the settlement but are otherwise very similar to other OTM options. These options, weighted higher in the VIX calculation, exhibit a jumps in trading volume at settlement." "The last ten years have been challenging for many long‐only commodity futures investors and given many a reason to question whether a ‘bad’ investment strategy drove a bad outcome or a ‘good’ strategy experienced an unlucky outcome. The total return of the S&P GSCI commodity index was ‐4.6% per year, much lower than the +7.4% return for the S&P 500 stock index and the +4.5% return for the Barclays U.S. Aggregate bond index. The key driver of the poor S&P GSCI performance has been a ‐8.0% income return. The commodity income return is the sum of a collateral return (in this case the three‐month Treasury bill) and a roll return (the cost, or benefit, of staying invested in futures contracts over time). 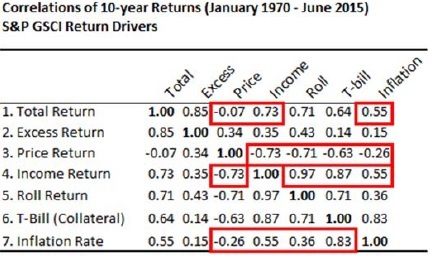 5) a negative relationship between income returns and price returns. There are at least two opposing views to explain the decline in income and roll returns. The first view offered by Bhardwaj, Gorton and Rouwenhorst (2015) is that there is in fact no difference between pre‐2004 commodity performance and post‐2004 commodity performance. Their view is illustrated by looking at the performance of a hypothetical, equally‐weighted paper portfolio created by Gorton and Rouwenhorst (2006). This paper portfolio embeds a common smart beta strategy, rebalancing an equally weighted portfolio. Working with an intuition that commodity futures markets are risk transfer insurance markets for commodity hedgers, Bhardwaj, Gorton and Rouwenhorst also find no evidence that an influx of long‐only financial commodity investors over the last decade has impacted the historical or prospective returns of their hypothetical paper portfolio. Summing up the impact of the last decade, they find “the risk premium has been comparable to its long‐term historical average”. Norrish (2015) argues that Gorton and Rouwenhorst’s hypothetical paper portfolio “is not a viable option for most investors”, and reflects an alternative view that over the last decade an influx of long‐only financial investors significantly lowered returns for actual and tradable long‐only commodity indices. Echoing the view that commodity futures markets can be viewed as price insurance markets, Norrish’s view is that there has been too much long‐only insurance capital chasing too few insurance opportunities. If too much insurance‐inspired capital has lowered returns then perhaps a contraction in insurance inspired capital might increase returns." In this paper, we propose a gold price index that enables market participants to separate the change in the ‘intrinsic’ value of gold from changes in global exchange rates. The index is a geometrically weighted average of the price of gold denominated in different currencies, with weights that are proportional to the market power of each country in the global gold market, where market power is defined as the impact that a change in a country’s exchange rate has on the price of gold expressed in other currencies. We use principal components analysis to reduce the set of global exchange rates to four currency ‘blocs’ representing the U.S. dollar, the euro, the commodity currencies and the Asian currencies. We estimate the weight of each currency bloc in the index in an error correction framework using a broad set of variables to control for the unobserved intrinsic value. We show that the resulting index is less volatile than the USD price of gold and, in contrast with the USD price of gold, has a strong negative relationship with global equities and a strong positive relationship with the VIX index, both of which underline the role of gold as a safe haven asset. "The market for gold is one of the largest and most liquid in the world, surpassed only by the major currency pairs in terms of daily turnover. The price of gold, like that of many commodities, is conventionally quoted in USD. However, gold is not exclusively a US asset and so the return from an investment in gold, when calculated using the quoted USD price, conflates the change in the value of gold with the change in the value of the USD. In this paper, we develop a gold price index, which when used to compute returns, reflects changes in the intrinsic value of gold independently of concurrent changes in global exchange rates. Various index-based approaches go some way towards removing the exchange rate component of the gold price, they do not properly reflect the intrinsic value of gold because they use arbitrarily defined weights that do not represent the actual impact that changes in individual exchange rates have on the quoted gold price. 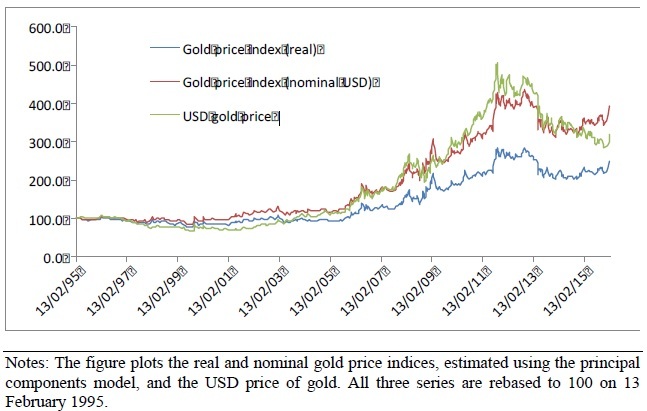 The gold price index that we develop can be thought of as a geometric weighted average of the normalized real (i.e. inflation-adjusted) price of gold in different currencies. The weight of each currency is proportional to that country’s market power in the global gold market, as reflected in the impact that a change in the country’s real exchange rate has on the real price of gold quoted in other currencies. We cast the relationship between the price of gold, exchange rates and a broad set of fundamental variables in a cointegration framework, in which we simultaneously model both the long run relationship between the price of gold and its determinants, and its short run dynamics. We use weekly data from 3 January 1995 to 26 October 2015 for 23 exchange rates against the GBP. In view of the very high correlations between many individual exchange rates, we use principal components analysis to extract the significant underlying exchange rate factors. Over the full sample, we find that there are four ‘significant’ principal components in real exchange rates, which are shown to represent the USD currency bloc, the commodity currency block, the EUR currency block, and the Asian currency bloc, respectively. The cointegration framework allows us to distinguish between the long run and short run elasticities of the price of gold with respect to exchange rates. In particular, the long run elasticity with respect to an exchange rate (or an exchange rate bloc) partially reflects structural changes and, in particular, the impact that a change in the exchange rate has on fundamentals through, for example, changes in production capacity or demand. In contrast, the short run elasticity reflects the change in the gold price arising directly from changes in the exchange rate, i.e. changes in the price of gold that simply reflect ‘translation’ effects. It is these short run elasticities that are relevant for the construction of the gold price index. We therefore first estimate the long run relationship between the real price of gold, real exchange rates and proxies for the non-exchange rate related fundamentals, including global equity and bond prices, the oil price and the level of the VIX index of implied volatility, and show that these variables are strongly cointegrated. The gold price has a negative long run relation with global equity prices and a positive long run relation with global bond prices, the price of oil and the VIX index. Gold has a positive long run relationship with the USD bloc, the EUR bloc and the commodity currency bloc, but a somewhat weaker relationship with the Asian currency bloc. We then estimate the short run dynamics of the change in the gold price as a function of (1) changes in exchange rates, (2) changes in fundamentals and (3) the lagged error correction term that captures the deviation from long run equilibrium. The short run elasticities from this regression are then used as weights in the gold price index. Using the full sample to estimate the model, we show that the (normalized) weights on the USD bloc, the commodity bloc and the EUR bloc are about 21%, 48% and 31%, respectively, reflecting the relative importance of these currency blocks for production, consumption and investment in the global gold market. The weight on the Asian currency bloc is not significantly different from zero. We convert the real gold price index into a nominal USD gold price index to enable a comparison with the USD price of gold. We show that the nominal gold price index is less volatile than the USD gold price and, in contrast with the USD gold price, has a strong negative relationship with global equities and a strong positive relationship with the VIX index, both of which underline the role of gold as a safe haven asset." A recent paper takes a look on Time-Series (TS) vs. Cross-Sectional (CS) version of momentum strategy. Analysis is made on equities but, in our opinion, has implication also on TS vs. CS momentum strategies on futures. Recent evidence on momentum returns shows that the time-series (TS) strategy outperforms the cross-sectional (CS) strategy. We present new evidence that this happens only when the market continues in the same state, UP or DOWN. In fact, we find that the TS strategy underperforms the CS strategy when the market transitions to a different state. Our results show that the difference in momentum returns between TS and CS strategies is related to both the net long and net short positions of the TS strategy. "The recent evidence on momentum returns suggests that the time-series (TS) strategy proposed by Moskowitz, Ooi and Pedersen (2012) outperforms the cross-sectional (CS) strategy of Jegadeesh and Titman (1993) because of its stock selection abilities. However, Goyal and Jegadeesh (2015) show that the TS strategy outperforms the CS because of the compensation of its net long position instead of its stock selection abilities. They argue that TS is a combination of a zero-net investment strategy and a net long investment in the risky assets, whereas CS is an entirely zero-cost strategy. Therefore, the compensation of the net long investment in risky assets enhances the performance of the TS strategy which not only earns the risk premium relative to the CS strategy but also benefits from market timing because there are more up than down markets. In this paper, we empirically examine whether the TS strategy outperforms the CS strategy because of its net long position by conditioning momentum returns on market states. We define market states based on lagged 12-month (t-11) and subsequent month (t+1) Centre for Research in Security Prices (CRSP) value-weighted market returns. A market state is identified as UP/UP (DN/DN) when the lagged, and subsequent market returns are both positive (negative). We classify the market state as UP/DN (DN/UP) if the lagged 12-month returns are positive (negative) and the subsequent market returns are negative (positive). To the extent that momentum returns of the TS strategy exceed the CS strategy because of its net long position as suggested by Goyal and Jegadeesh (2015), then TS momentum returns would be relatively higher in UP/UP market because the net long position would time the subsequent UP market. However, if TS momentum returns exceed the CS because of its active position whether net long or net short, then we should expect relatively higher TS momentum return in market continuations whether UP/UP or DN/DN because the net long (net short) position times the subsequent UP (DN) market. Furthermore, we expect that the TS strategy would underperform the CS strategy in market transitions (UP/DN or DN/UP) because the net long (short) position of the TS strategy negatively times the subsequent DN (UP) market. Consistent with our expectations, we find that the TS strategy outperforms (underperforms) the CS strategy only in market continuations (transitions). We find that the net long/short position times the market in market continuations which enhances TS momentum returns. However, in market transitions, the net long/short position exhibit negative autocorrelation with the subsequent market returns which results into larger losses for the TS strategy."